Please keep Jenifer in your prayers, her life is hanging in the balance. Thank you SO much everyone who is praying and those who have let me know they are! God bless you! As people, we don't always seize the opportunity to let others know how much they mean to us, and that's sad. Not so with God. He created this entire universe to give us a place to live while we choose whether to love Him back or not. Every time our eyes are open they are filled with testaments to His love for us. Every time we hear a bird, a song, a baby or a babbling brook His love for us is unquestionable. Every time we smell a flower or the freshness after a rain He's showing His love for us. Every breath we have is a gift of love from Him. Every heartbeat is His alone to give. And if that weren't enough, He sent His ONLY begotten Son to teach us about Him and how we should live, then to give His sinless life as a ransom for our sinful ones so that we would be able to be with Him eternally, if we took Him as our Savior and obeyed Him in love. Still not enough? He put it in writing for all time. He has put His love letter on paper and protected it and it's integrity all these many years so that we would know Him, know His love for us and know how to be saved and with the One who loves us eternally. Let's not ignore His innumerable declarations of love that surround us every minute of every day of our lives. Open our eyes! Shake off the delusion we so often live in and look around. Open our hearts to this amazing love that we can't even fathom. And once we see this love for what it is, it will be only natural to repent of our sins and ask Jesus to be our Savior. The natural result of knowing Him is to love Him in return and the result of that love is obedience. Extending one day - TODAY IS THE LAST DAY OF THE BIG 1st ANNIVERSARY THANK YOU SALE! DON'T MISS IT! Thank you all so very much for your support this year - your visits, your comments in posts and e-mail, and especially your prayers for the mission of this blog - to share the love of Christ, for an entire year now! Wow! I'm completely blown away by all God has done, including blessing me with such cherished new friends around the world! Recently I started expiring some of the links for the free gifts I've given you every day this year and have collected them into kits to sell in an effort to recoup some of the expense of running the blog. A special hug and deep gratitude to those of you who have bought something to help! God bless you! To say THANK YOU to ALL OF YOU in a more tangible way, I'm putting the entire store on sale from Saturday the 12th through Saturday the 19th! If you buy two kits, you can have a third kit of equal or lesser value FREE! 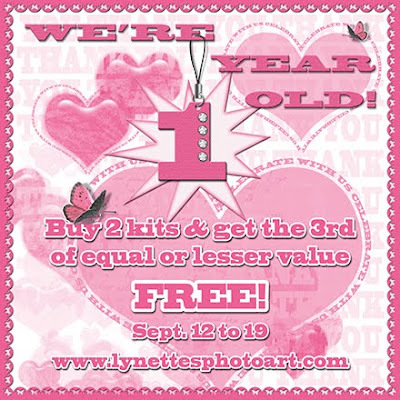 Just e-mail me at lynette@lynettesphotoart.com and tell me the kit names you want and I'll send you a PayPal invoice. Or you can just use the Buy It Now buttons for the two most expensive items and then e-mail me the name of your choice of FREE KIT. Now's DEFINITELY the time to scarf up on all my goodies including several fall kits and a winter one - NO LIMITS! There are 51 kits for sale now, so there's something for EVERYONE! Thank you for helping in this work for God! Click image to go to the store. You're an angel on earth ! Thank you so much for this Freebie. 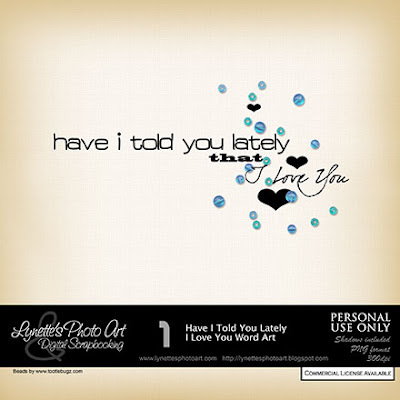 I want to let you know that I posted a link to your blog in CBH Digital Scrapbooking Freebies, under the Page 11 post on Sep. 20, 2009. Thanks again. My father told my mother...Have I told you lately that I love you...EVERY day. They were married 49 years. Thank you for the perfect word art for my page to honor them. Thank you for your freebies. muchas gracias por compartir tu hermosisimo trabajo! Thank you very much for share your beautiful work! Blessings from México!